Hello and welcome to our website. We look forward to hearing how we can be of service to you. Background: Our experience dates back to 1972 employing leading edge technologies on the shores of Lake Austin - technologies still not well understood by many in this industry. We are proud to have set the standards that have now become common practice in the septic industry, and we continue in that leadership position. Commitment: We will provide you with "Quality Service...Guaranteed" in all of our services. We support that commitment with our written policy of "Satisfaction Guaranteed". Contact us by phone, mail, fax, email, or join us on Facebook. We look forward to providing you "Quality Service...Guaranteed". 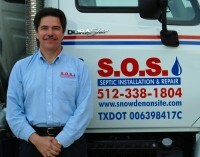 Check out my interview, Septic System Design and Repair 101 on TexasHomesForSale.com, one of the top sites for homes for sale in Texas, including Northwest, TX real estate. Texas Homes also services Conyers, Georgia Homes and Santa Fe, New Mexico Real Estate .